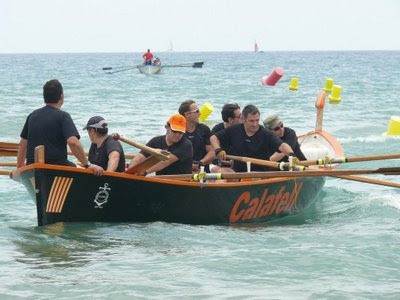 Ben at The Invisible Workshop has gone rowing with the local team in their llagut, an eight oared gig that can also set a lateen sail (this is not the boat he went out in, but one from Calafell just along the coast to the east - picture from calafellvalo's Flickr photostream). It was not a friendly crew, Ben says. They just went out and did it. And the boat lacked any flotation, bailers or lifejackets. I don't think he need be concerned - rowing boats don't lean over sideways like sailing boats do, so they rarely take in any water at all. And the freeboard looks high enough to prevent almost all waves from tipping water inside. I also suspect the crew will become a bit friendlier if Ben returns - as one of them told him, all clubs see a procession of people turning up unannounced expecting a brass band, but are never seen again. It is worth sticking with it though. Rowing as part of a crew on song, everyone exactly in synch, is a wonderful experience. A hint of this is shown in this video of the women seniors' race at the Catalonia Llagut Championship 2006. Perhaps another club might be friendlier. The bunch you went out with sound a bit grim I must admit.